Uttarakhand State. Candidates who have full fill age, education and other qualifications can apply for Uttarakhand FCI Watchman Recruitment vacancies. 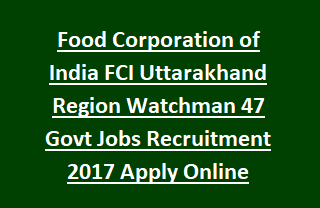 Online registration of FCI Recruitment Watchman vacancies applications available from 14-12-2017 at Uttarakhand Food Corporation of India official website @ https://www.fcijobsukd.com/. Current Recruitment of Watchman vacancies selection is based on Physical endurance Test and written Test. Submission of FCI Uttarakhand applications through online will ends on 14/12/2017. Uttarakhand Food Corporation of India FCI Watchman vacancy Recruitment qualification, age, salary, application submission dates and other detailed info are given below. Total available Watchman vacancies available in Uttarakhand FCI Recruitment are 47 posts. Post Name: Watchman: 47 posts. Minimum educational qualifications required for applying Watchman posts is candidates must have passed 8th standard (by 01/08/2017). Age of candidate for FCI Recruitment jobs is between 18 years to 25 years as on 01-08-2017. Upper age limit is relaxed by 05 years for SC/ ST candidates and 03 years in case of OBC candidates. 10 years age relaxation will be given for PH candidates and the candidates belongs to PWD/ PH of SC/ ST age relaxation of 15 years will be given. Candidates applying for FCI Watchman vacancies will be recruited based on written test and Physical Endurance Test. Written test comprises of 120 MCQ type questions related to the topics of General Awareness, General English, Qualitative Aptitude and Reasoning. Each question carry 01 marks and there will be no negative marking. PET is only for Qualifying purpose. For PWD/ PH candidates Physical Endurance Test is exempted. Short listed candidates will be placed at FCI website @ https://www.fcijobsukd.com/. Examination center and date of examination are given in the departmental (FCI) notification. All candidates must have to upload photograph and signatures along with prescribed application form which is available from FCI website @ www.fciregionalijobs.com. Candidates are required to send application fee of Rs. 250/- through Internet Banking/ E challan. SC/ ST/ PWD/ Ex Serviceman/ Woman/ Service Defence Personnel candidates are exempted from the payment of fee. Apply online for Watchman jobs in Uttarakhand FCI Recruitment vacancies 2017.